Overview: Overview: Shaggy manes are a sought-after choice edible mushroom. These widespread and common mushrooms have a very short shelf-life, typically only lasting 24 hours from emerging to liquefying. This mushroom does not easily drop its spores. 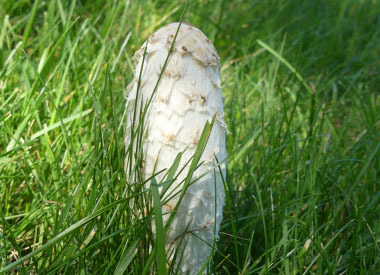 Some people have reported taking some shaggy manes, placed them in a little amount of water (to make a slurry) then poured it on their lawns to grow their own. (Whether this works or not has not been verifed.) Interestingly, DNA studies show that Coprinus comatus is fairly closely related to species of Agaricus and Lepiota, but only distantly related to most other mushrooms whose gills turn to black ink. 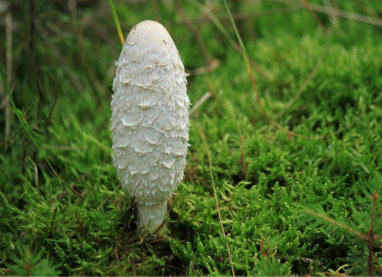 Shaggy manes “slightly” resemble Tippler’s Bane (Coprinus atramentarius) which also is edible, BUT can cause serious issues in the body if alcohol is consumed 48 hours or prior to eating them..
Distinguishing Features: The shaggy mane has very distinguishing features. Its cap typically measures 5 to 14 cm tall, and is 2.5 to 4.5 cm across. It is columnar, becoming bell-shaped. The surface is dry, white with a brown central disc, breaking into coarse, white and brown recurved scales. Height: Height: The stalks generally reach 15cm tall and are 1 to 2 cm thick. Stems are hollow, with a string-like strand of fibers hanging inside. Habitat: These mushrooms grow in disturbed grounds, grass, wood chips, or hard-packed soil. They often appear shortly after a good rainfall. They grow singly or scattered but often in large,tightly packed groups. They are found in lawns and pastures in urban locations as well as in rural areas. 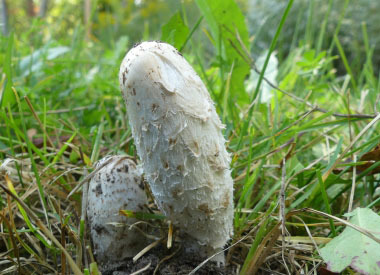 Shaggy manes grow in many countries throughout the northern hemisphere. They also occur in Australia and New Zealand. Spore print: Dark spores - black. Gills: Gills are white, adnexed to free (close together), free gills that eventually become black and inky. 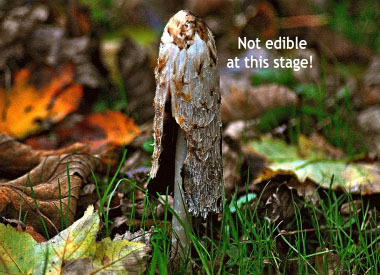 Edibility: Shaggy manes must be gathered at an early stage, before they become inky. They will turn inky within a few hours after picking and so they should be prepared almost immediately. Although refrigeration will slow down the inky process somewhat, they will not keep. Always cook before consuming. They are usually enjoyed sauteed or added to favourite meals. They are good sautéed and can be served as a stand alone dish. Shaggy manes are good deep fried in tempura. 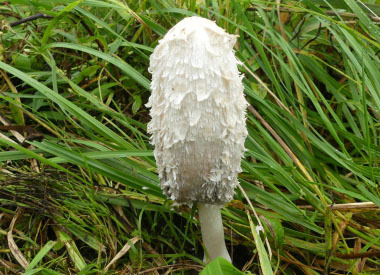 Other name: Shaggy Ink Cap.